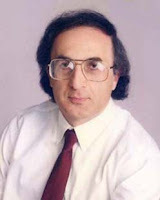 The gentleman above is Dr. Gagik G. Melikyan. He has written a book called Guilty Until Proven Innocent which I am aware of thanks to a review in Chemical & Engineering News. I have not read this book and probably never will, but it appears to be an extreme expression of the chemophobia of our times. According to the review, Dr. Melikyan thinks that "consuming some substances found in nature can be as detrimental to the human body as exposure to hazardous synthetic compounds" and that "people should question the veracity of claims that certain “natural” products will improve their health or extend their lives." I agree with that. Every substance encountered in the universe is a chemical (to quote Wikipedia.) Most, but not all, of the modern fear of "man made" chemicals is tree-hugging hippy crap rooted in scientific ignorance and appeals to nature. Such fears are particularly widespread in Prof. Melikyan's stomping ground of Californ-i-a. He, however, appears to be more fearful of natural chemicals than of the manmade variety, and he is prepared to take the precautionary principle to ludicrous extremes. Melikyan firmly backs the notion of precaution, especially in the case of natural products that are complex mixtures of chemicals. He even examines an aqueous mixture that is almost sacred to many: coffee. He dares argue that people should forgo drinking java until scientists can show explicitly and independently that every chemical in coffee and all metabolites are safe for long-term consumption. He brushes off people’s passion for coffee. “There was life before coffee, and there will be life after it,” Melikyan states. Such a task could easily take centuries. According to this (not necessarily authoritative) source, there are around a thousand chemicals in a cup of coffee, and proving total safety is not a simple matter. As coffee has been used for millennia, couldn't we just take its safety and efficacy as read? Apparently not, and tea doesn’t get a pass either. As I mentioned, Dr. Melikyan is a resident of California and has absorbed the prohibitionist mentality of the Golden State. Melikyan’s attacks on coffee and tea are just a warm-up for his mind-boggling policy conclusions, which he acknowledges will invite intense criticism. "Fools! I'll destroy them all!" "Once we have established the structures of all food compounds, their behavior inside the human body, the metabolic pathways, the structures of compounds enzymatically formed inside the body, and their physiological properties, we, as a society, can rest assured knowing that the products that constitute the bulk of the consumer basket are truly safe for consumption." Note how "we, as a society" has become indistinguishable from "I, as a fruitcake". The dose makes the poison, my friends. Forget that, and madness reigns. All fruit and veg contain natural insecticides - how are we to avoid them? Still, adoption of his proposal would make fruitful(!) careers for him and his students. That is one seriously fab combover Melikyan has. The clown forgot to mention water. Once he starts on that, we're finished. "Scientists, he contends, can do better than nature by finding safer, alternative means for making caffeine available to the public." So we should leave it all to the GM,Chemical company scientists to make a healthy nutritional paste that we can live on forever and ever, without fear of those scary little plant chemicals in vegetables that may harm us if we eat them in a kilo's worth at a time, and they will have to take over guardianship of the plants, medicines and agriculture of the entire world so we don't have to worry our pretty little heads any more. "put down the carrot and step back"
As I look at the man, I’m convinced that it’s superior people like Gagik G[aga] Melikyan, with his Sesame Street good looks (is that a puppet on his head? ), who should be running the world. Really, just how long does this man think people have been drinking coffee ,my guess is tens of thousands of years. As for Tobacco Coca, Kat, or Cannabis ,probably longer. All stone age pursuits i'm sure. "tens of thousands of years": not for the ones from the New World, obviously. And this man's book will probably land front and center in multiple copies in all library locations throughout the city of San Francisco. Meanwhile, your books, they would never bother to hear of it, let alone anything else giving alternative argument to everything from health-fascist-lifesylism to AGW. Al Gore is another one plastered all over the library system, but nothing to debate it. You should offer to send both San Francisco and Los Angeles library systems a set of your books for free - then see if they refuse to accept it. In which case you know then they're impenetrable to any ideas outside of their narrow little indoctrinated weird world. If nothing else it would make for great publicity stunts and could be used to generate Press Releases, should any over-the-top narrow-minded illiberal-liberal library systems refuse your offerings. Well Daarieme the Americas appear to have been inhabited for between 15,000 and 20,000 years. This is, of course, based on the current evidence and will almost certainly change. So as I suppose the consumption of native plants follows, fairly quickly, behind habitation the use of the term tens of thousands of years is not incorrect. I was hoping for something a little more erudite, instead I can only think of this. If he believes that wearing large glasses makes his ludicrous forehead look smaller and more identifiable with the human race then he can pop his head up botty. In the meantime somebody remind him not to tilt his head forward – or he’ll lose what few marbles he has left. That was sort of erudite. I think that these people lose sight of the fact that, to be harmful, one would have to drink tea and coffee for a couple of hundred years before any signs of damage appeared - if ever. There are 4,000-7000 theorized chemicals in tobacco smoke (there are 2,000 in coffee) of which only 65 are vaguely carcinogenic. None exist in any quantity to cause harm. I can only assume some of the people commenting here are displaying symptoms of physcho-somaticism, it's all the mind or fancy a fat payout from the courts. In 1991 an experiment was done on side stream smoke (SSS). SSS is undiluted by inhalation via a smoker's lungs where 95% of the chemicals are ingested. The setting was a room 20 feet by 24 feet by 9 feet, sealed and unventilated and the "sniffer" was 6 inches away from the lit cigarette. It produced the following results whereby you would have to be surrounded by the following number of smokers to reach a dangerous level. So you are telling me smoke travelling 10-20 feet diluted by other air is a health hazard? You remind me of alchemists of the middle ages. Benzene constitutes 3% of a gallon of gas, and is often unburned in a car engine, the by product is benzo(a)pyrene. Your car will kill far more people before a smoker. I think it will be wise for everybody to take a deep breathe and read this book before posting any comments.